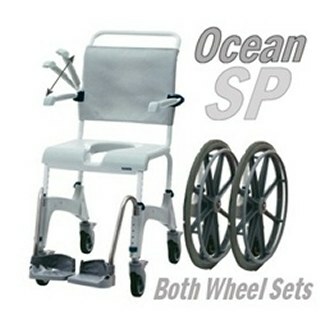 Ocean SP includes both wheel options, 5" locking swivel casters and 24" self-propel wheels with push rims. Easily converts to self-propel chair. Change wheel sizes on-the-fly. The Ocean SP is constructed from stainless steel for maintenance-free, rust-free use. The seat frame has a 10 Degree back tilt for comfort. The back upholstery is also adjustable.